The new $999 model has a high-grade optical construction consisting of 18 elements arranged in 13 groups, with one FLD type low-dispersion element, which the company claims to have a similar performance to fluorite. It also has no less than seven SLD (ED type) elements, two of which are aspheres to reduce lateral chromatic aberration, field curvature, and spherical aberration. The lens also features a third, large-diameter aspherical element to minimize distortion. Like previous Art series models, it has sonic-type AF motor and has what Sigma claims is an optimized algorithm for smoother focusing. The lens has a minimum focus distance of 11” (28cm), a large 82mm accessory thread, measures 3.4 x 4.8” (87.6 x 122.7mm), and weighs in at a substantial 33.2 oz (941g). We’ve now assessed the Nikon-mount version of the lens across a range of F-mount DSLRs, including the 36-Mpix Nikon D810, and are delighted to reveal the results. Tested on the 36-Mpix Nikon D810, the Sigma 24-35mm F2 DG HSM A achieves a very high DxO Mark lens score of 36 points, which ranks as the best zoom we’ve tested on this camera in outright optical performance. Like a lot of zooms, particularly constant-aperture models, it reaches peak performance in terms of sharpness and uniformity, distortion, and transmission in the center of the focal range. At T2.2 at 24mm and then falling back to T2.1 at 28-30mm, and then increasing again to T2.2 at 35mm, this ultra-high-speed constant-aperture zoom has excellent transmission. In terms of sharpness and uniformity, this lens is outstanding. Peak sharpness is achieved when stopped down to f/5.6, but unsurprisingly, perhaps, there’s some slight variation in performance wide-open. Then it is sharpest at either end of the zoom range, but while it’s a little softer between 28-30mm, it’s still very good even at the edges of the frame. Stopping down just one stop to f/2.8 increases sharpness significantly, with consistent sharpness right across the image field. Wide-angle zooms tend to suffer from chromatic aberration, particularly at the wider end, and as an ultra-high-speed model, we would expect fringing to be problematic. It’s all the more surprising, then, that this unique f/2.0 model is very highly corrected, and the results show no cause for alarm. Chromatic aberration is higher at 24mm, where it may be noticeable in the corners, but it gradually falls as the focal range increases to 35mm, where it’s exceptionally low at all apertures. Control of distortion is generally good, with some barrelling at the wider end, but it has slightly high levels of pin-cushion distortion at 35mm. Vignetting is also a little higher than we’ve seen in modern designs, but it’s not unexpected for an ultra-high-speed model. Vignetting peaked at –2.1 EV in the extreme corners of the frame, and was more noticeable (i.e., occupied more of the image field) at the longer focal lengths. The relatively affordable $1299 Tamron SP 24-70mm F2.8 Di VC USD and the $2400 Nikon AF-S Nikkor 24-70mm F2.8E ED VR cover a wider range than the Sigma and both offer sonic-type AF motors, constant maximum apertures, and stabilization, the latter going some way to offset the Sigma’s faster maximum aperture. Stabilization doesn’t counteract subject movement, but it’s useful for reducing camera shake in low light. 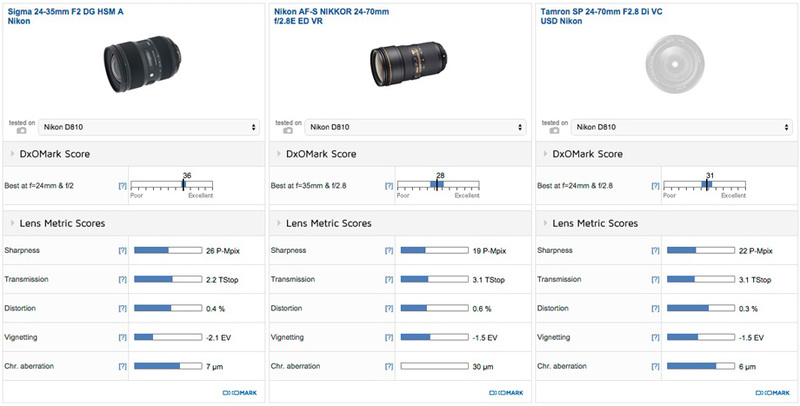 All three models perform well, with Nikon’s own Nikkor brand 24-70mm f2.8 coming in third with a DxO Mark score of 28 points, and the Tamron in second place with 31-points, but that’s not such a surprise, given the extra level of difficulty in making wider-range zooms. Still, it does show just how good both the Tamron and Sigma models are, and the latter’s wider aperture is at least as challenging optically as the extra reach. Sigma’s higher peak sharpness and low levels of chromatic aberration are impressive, but at f/2 the Sigma isn’t as sharp as either the Nikon or Tamron at f/2.8 over the same focal range. With the Sigma stopped down to f/2.8, though, it is superior to both, and particularly so in the outer field at 24mm. Stopping down further, the Nikon doesn’t fare that well in the outer field due to a combination of strong chromatic aberration, curvature of field, and astigmatism. The Tamron comes close to the Sigma from f/4 through f/8, but similarly suffers from some astigmatism, which can be troublesome (although it depends on the subject and its position in the frame). All three models have better control of uniformity and fringing at 35mm, but the Sigma leads until f/8, where the Tamron matches it more or less across the whole image field. As for vignetting, at maximum aperture the Sigma has more to contend with than its rivals, and it has slightly higher pincushion distortion at 28-35mm, but it has lower barrel distortion than either at 24mm. 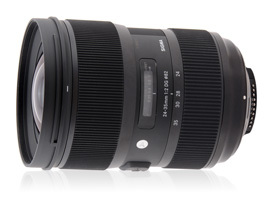 At around $999, the Sigma 24-35mm f2 DG HSM A is reasonably affordable, fast, and optically outstanding. It can easily take the place of a 24mm and 35mm lens, but of course it is not as convenient as the more typical 24-70mm focal range of standard zooms. And as we’ve seen recently, manufacturers are adding stabilization to those models, making them a lot more attractive to a wider audience (if you include videographers). Nevertheless, the Sigma appeals to same crowd and is more accessibly-priced than either the new Nikon or Tamron. In spite of the somewhat narrow focal range, it is an attractive alternative, and it will likely be a popular choice with enthusiasts looking to cut down on the number of lenses they carry.